Pictured right: Cool Touch, Cool Blue, Love Lilac and Coral Craze. (Cue sob story) - When it comes to nail varnish I have always been a big fan of the Rimmel London Lasting Finish collection, however no matter what, my nails are ALWAYS chipped within 24 hours. On top of that I can never bring myself to spend £7-£8 on a nail varnish when they get chip so easily. Also if I did end up enjoying the product it can amount to being an expensive choice. 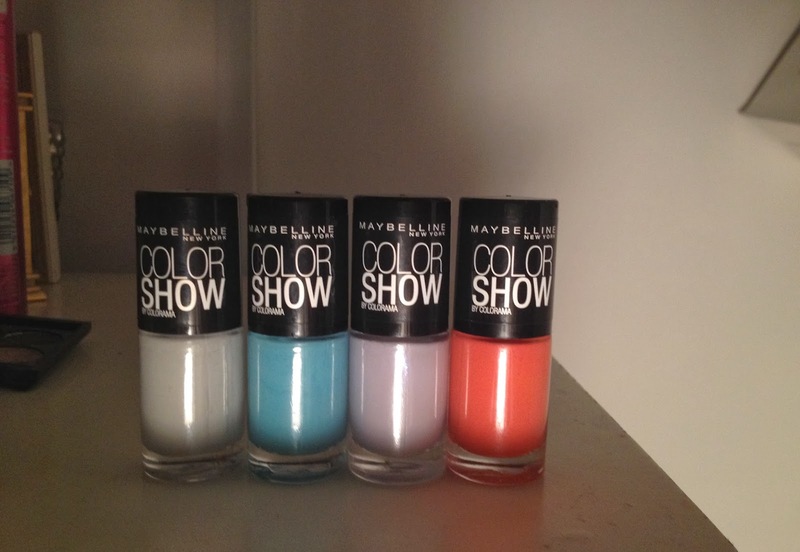 So, I was in Superdrug one day and by chance came across the Maybelline Color Show nail varnishes simply out of interest as they were only £2.99 and also 3 for 2!! Winner!! I picked up in the colour "Love Lilac", which has a lovely but very subtle blue shimmer to it. After applying 2 coats and my trusty Sally Hansen top coat I let it dry and went about my day. I'm still here a full week later with only ONE chipped nail!!! Any surprise I went back today and purchased three more?? Nope. According to Maybelline this range of polishes contain a transparent gel base which I assume is the reason for the impressive longevity of them. Btw, the shoes are from H&M.